Pack Up the Cats Album reviews. Local H is back with a brand new invention, something grabs ahold of you tight. Oh wait, wrong band. 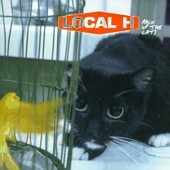 But yes, Local H is back with a new album. This time they are crunching just a bit harder than on their last one, As Good As Dead. The new album features the two member band putting out tunes like you have not heard in a while. Pure grunge rock - that is what they are. I was actually surprised to hear the underproduced, raw rock sound reminiscent of the early 90s. I had thought those days were gone, but Local H has proven otherwise. Their sound is very similar to that of early Nirvana - from Bleach or Nevermind. What I find most interesting is the fact that the band is actually only two members. Of course, when they tour they add a few extras - or else the sound would be too hollow. Dean DeLeo (of STP and Talkshow) plays along as additional guitar on a few tracks of the album. There is nothing totally breakthrough on the album. It is mostly all rehashed rock. I am not trying to say their sound is bad, it has just been done already. If you are looking for a good rock album, this may be the one for you. Tracks like the first single "All the Kids are Right" showcase the band's taste for raw music. I saw them open up for Smshing Pumpkins a few years ago, and I feel this new album portrays their live sound much better than As Good As Dead. This is nothing to squawk about, but if you want to feel like you are back in the days of early Nirvana or Soundgarden - pack up the cats and get the disc.